A classic tale by Newbery Medalist Kate DiCamillo, America's beloved storyteller. One summer’s day, ten-year-old India Opal Buloni goes down to the local supermarket for some groceries – and comes home with a dog. But Winn-Dixie is no ordinary dog. It’s because of Winn-Dixie that Opal begins to make friends. 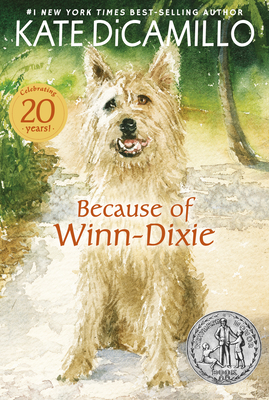 And it’s because of Winn-Dixie that she finally dares to ask her father about her mother, who left when Opal was three. In fact, as Opal admits, just about everything that happens that summer is because of Winn-Dixie. Featuring a new cover illustration by E. B. Lewis. Kate DiCamillo says of writing BECAUSE OF WINN-DIXIE, "I was living in an apartment where no dogs were allowed. As a result, I was suffering from a serious case of 'dog withdrawal.' One night, before I went to sleep, I heard this little girl's voice (with a Southern accent) say, 'I have a dog named Winn-Dixie.' When I woke up the next morning, the voice was still talking, and I started writing down what India Opal Buloni was telling me. The book is (I hope) a hymn of praise to dogs, friendship, and the South."